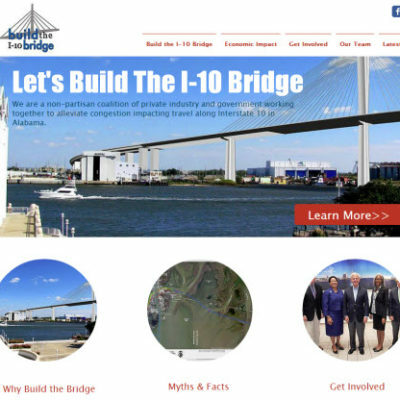 On Monday, August 18th, the Build the I-10 Bridge Coalition, in partnership with Coastal Alabama Partnership and the Mobile Area Chamber of Commerce, launched the new www.buildthei10bridge.com website. The site includes general information about the project, next steps in the process, ways for the public can get involved, and latest news. Supporters are encouraged to write letters of support, attend the public hearings, and follow the Build the I-10 Bridge Coalition on Facebook and Twitter.